April 1st is celebrated as April Fools' Day across countries. On this annual celebration, people prank each other trying to make them a fool. Meanwhile, funny jokes, hilarious memes and GIFs have taken over social media. And as we celebrate the day, we can't help but think of the famous 1964 movie April Fool. And on this day we take a look back at the popular lyrics of April Fool Banaya song which may come handy after fooling your friends. What's April fools' day without the song April fool banaya, toh unko gussa aya? Produced and directed by Subodh Mukherji the song stars this movie sees Biswajeet and Saira Banu in pivotal roles. The song was a collective effort of Song lyricists- Hasrat Jaipuri, music composer- Jaikishan Dayabhai Panchal, Shankar Singh Raghuvanshi, music director-Jaikishan Dayabhai Panchal, Shankar Singh Raghuvanshi, director: Subodh Mukherji and Music Label: Saregama. Best April Fools' Day 2019 Pranks: Unique and New Ideas to Trick Your Friends, Family or Colleagues on April 1. April fools Day may be about playing pranks but it also brings people closer. Like in the movie April Fool, Biswajeet aka Ashok pulls a trick on Madhu aka Saira Banu on April Fools' day, finally, they do fall in love later on. People have been singing and listening to this song since forever. However, make sure the prank you pull isn't to harsh or below the belt, if you do, apologise with this song. So don't forget to sing this song when you prank your friends or cousins and they get angry or upset with you. This song will surely cool them down. Some chocolates will help too! 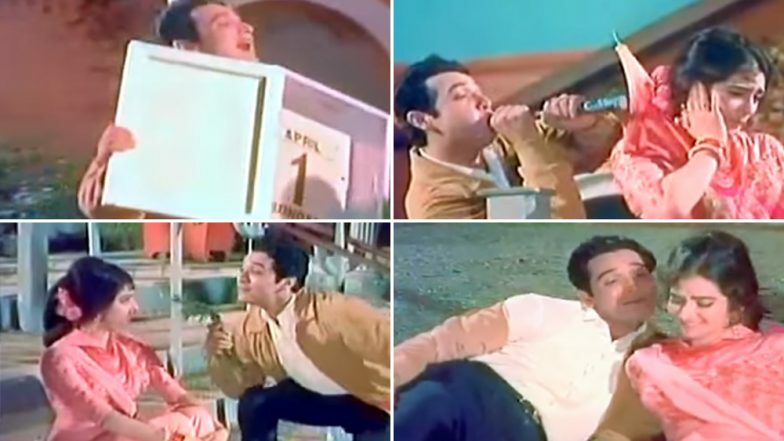 Padosan Now Joins IMDB's Top 100 Indian Films ie List; Lead Star Saira Banu Is 'Happy' Over This Appreciation!